Yuca fries, 2 cheese empanadas, 2 black beans empanadas and Tostones (plantain chips) best seller! Yuca is cassava, a vegetable root like potato, but tastier! Cream of Butternut squash Vg. 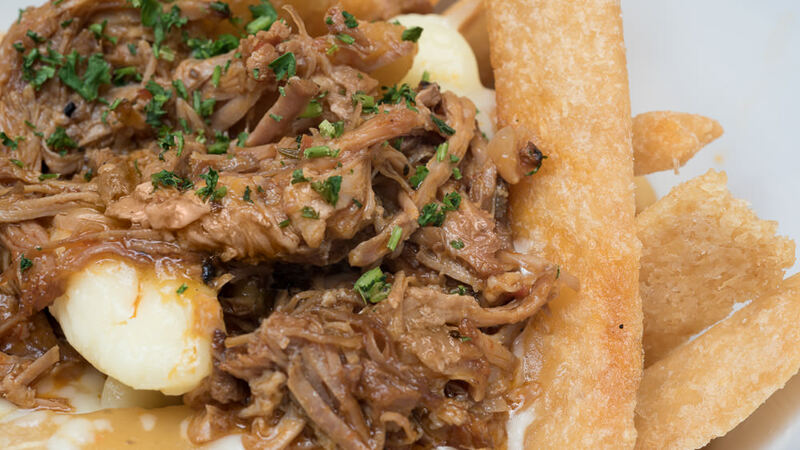 Yuca Poutine Vg. o Vt.
Yuca fries, home made vegan gravy, cheese curds, or tofu. Add your choice of mechada, chorizo or pulled pork. Old favorite is back! Layers of pasta, bolognese sauce (beef and pork), bechamel sauce, mozza and parmigiano cheese. 24 Hrs Special order: Safron rice, seafood, chicken bits, veggies. Min 2 person. — This is also a a well knonw Colombian dish! Topped with coleslaw, arugula, feta cheese, cilantro and sour cream. Plantains are bananas family, but starchier and no banana flavour . 3 soft shells each one with chicken, mechada and pulled pork. This is what Heaven tastes like! — Freshly made corn flour bread, naturally Gluten Free, naturally delicious! Shredded beef, plantain, black beans, cheese and avocado. House-made chorizo seasoned with chipotle and mixed with black beans. Roasted shredded chicken mixed with in-house-made guacamole. Butter garlic grilled shrimps mixed with in-house-made guacamole. Slow cooked pork shoulder, seasoned w/onion, garlic, tomatoes, rosemary, and thyme. Seared sesame seeds tofu and arugula. House-made black beans and fresh feta cheese. Seared tofu, plantain, black beans and avocado. Please enter some information about the event you are planning to host. Thank you, we will reaching out to you with more information. A whole plantain, melted cheese.